Well we finally did it. It was not easy getting everything ready in time but somehow it all barely came together thanks to some amazing friends and family. 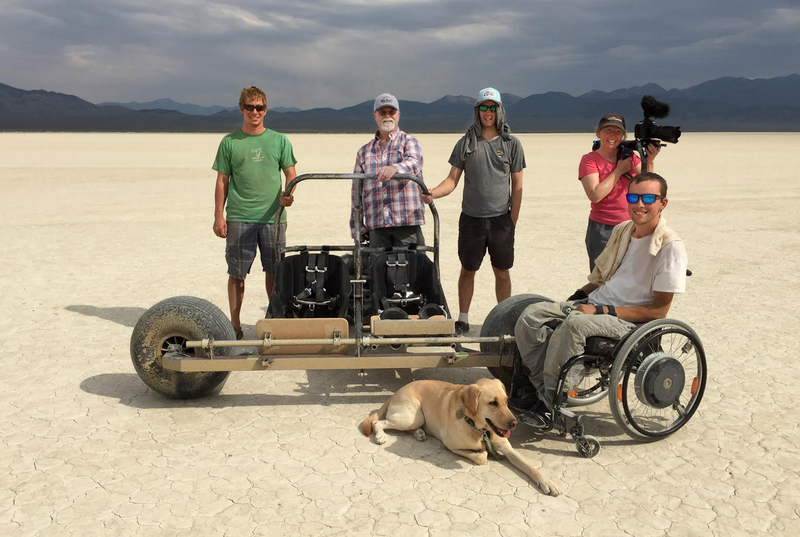 We made it out to Smith Creek dry lake in Nevada for two full days of buggy testing and craziness. 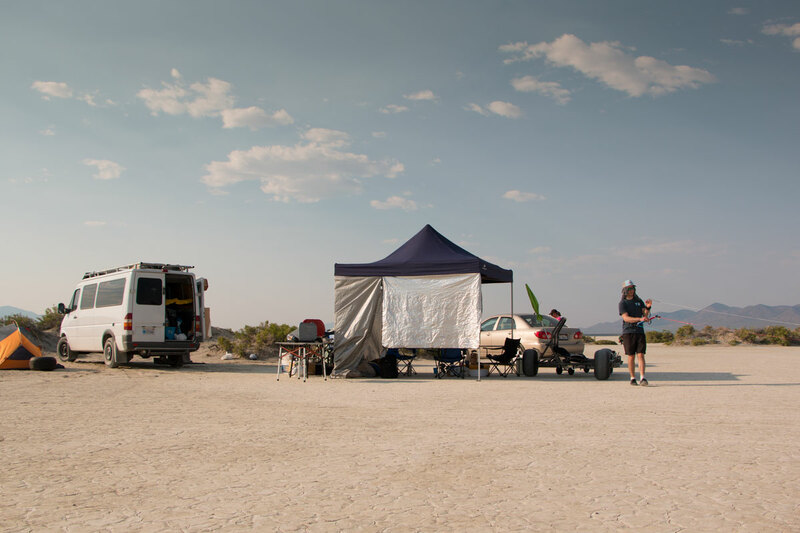 It was supposed to be more, but our camp was wrecked by a few violent dust storms, so we were forced to retreat, but not without some serious victories. Hot. Sunny. 100 degree heat in the sun. No wind all day. Nothing to do except listen to the 5 watt radio station being broadcast by one of the land sailors out there. No emails, cell phone reception, it was glorious. Then, right as the sun was dipping below the mountains the wind came up. Then it came up enough to launch a kite. Even though it was getting dark and any video footage we got would be crap, we knew we had to try it as wind was not guaranteed for tomorrow. So I was lifted in, strapped down, strapped into the kite and I started flying the 10m Ozone kite. 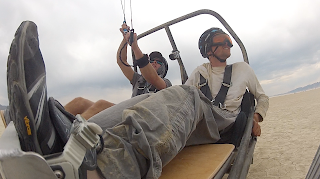 I hadn't ever flown a kite that big since kite surfing but it all came right back. 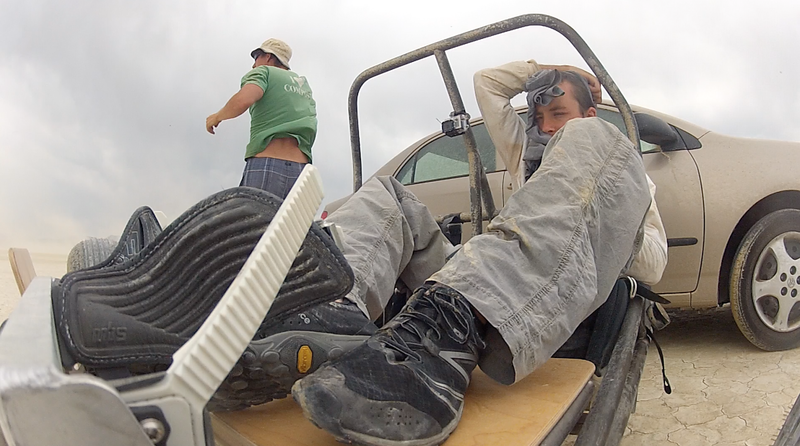 I was comfortable and after flying it briefly with the brake on, Brett released the parking brake and we were rolling. It was working! It was exactly like I expected it to be. Everything was perfect and we were cruising along at maybe 15-20 mph just gliding. It was so awesome. We did that for about 10 minutes before it got too dark to see where we were going! So we wrapped it up and called it a day. A very successful day. The wind was forecasted to be much better. 15 mph winds meant hopefully we could fly the bigger kite and have some more mellow runs. Not the case. 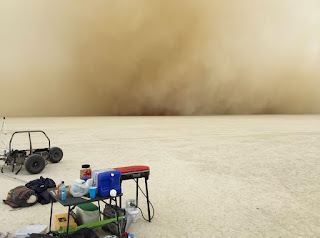 Around 11am the first dust storm hit. Out of nowhere came 30-40mph winds that destroyed our popup shade, turning it into a crumpled mass of modern art. As I was filming the carnage with my GoPro, a neighbor yells "here we go again!" 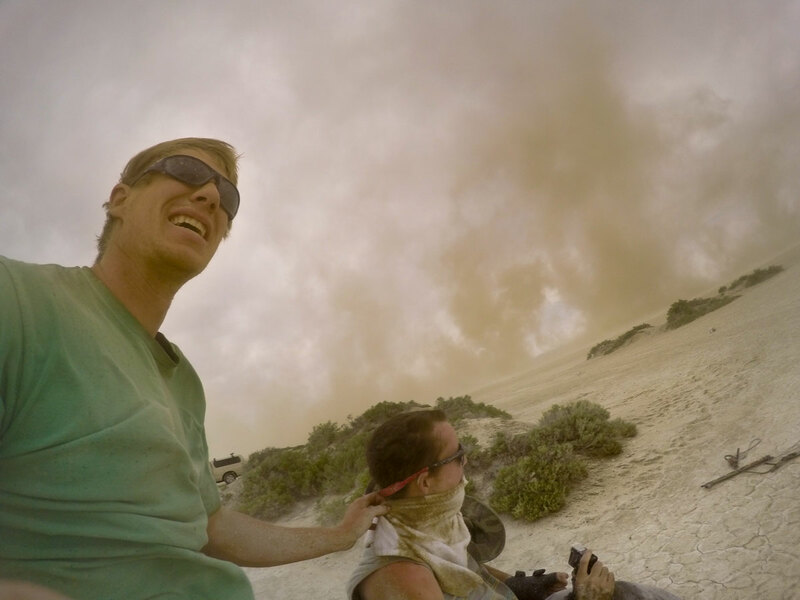 On the horizon there is dust cloud moving towards us. 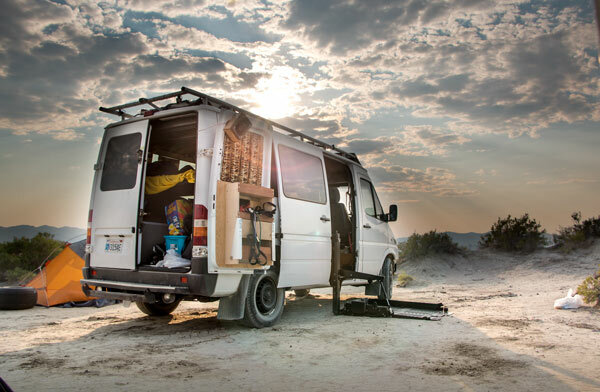 I should have closed the door to my van and even got inside but I wasn't sure there was time. So I just wheeled behind Nancy's car and set my brakes. The wall of dust approached and was weirdly quiet. When it hit it was like being sand blasted with rain and dirt. 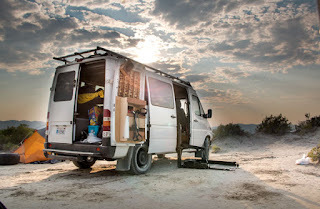 Every surface facing east was coated with an 1/8" of dirt, including the door that was left open on my van, sorry dad. One camper measured the wind at 70mph. We heard about a camper trailer that blew apart. Brett's tent was shredded as it was blown across the playa. 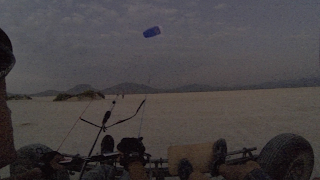 My 10m kite was shredded as it was blown across the playa with a water jug on it. Crazy. 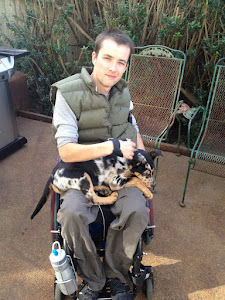 Then the wind was nice for a while so I got in the buggy. Then it was crazy again blowing 40mph. It was blowing too hard even for the 6m kite we brought so we decided to throw up a 2.5m trainer to see what would happen. Alex was working the crap out of that kite and we did some runs in the buggy and got up to maybe 20mph... off a trainer! When everything calmed down we decided to call it early and head home. Everything was so dusty, we had no shade. We drove home and thus ended our first ever trip to the desert!